Margaret is making potato salad in the kitchen, while Henry and Jacob sit at the table. Jacob shows Henry his drawing and Henry explains the problem with perspective in Jacob's work, so Jacob leaves to fix it. Margaret questions if Jacob saw the cross on the door and Henry says that Lucille cleaned it off before Jacob saw it. They are interrupted by a phone call which Henry answers. Henry learns that Addison pulled out of the deal. Henry decides to call Brian himself and Margaret tries to stop him saying that it wouldn't be good to be in business with someone like that. Henry is determined however to hear it from Brian himself. Margaret again tells Henry to drop it and adds that there will be other investors. Henry leaves the kitchen, not realizing that Jacob has heard the entire exchange. Rachel is having the amnio done while Tom holds her hand. On the way back home, they discuss potential names. Tom notices the little teddy bear that Rachel bought for the baby. When the baby starts to kick, Rachel grabs Tom's hand so he can feel it. Once again, the two share a moment and Tom slowly pulls his hand back as the light turns green. Maggie explains to Bellamy that Ray could get worse before he gets better with the treatment she has in mind. Bellamy questions how many more doses Maggie has and Maggie says not many and asks if Bellamy can acquire more. Bellamy replies that his source is no longer returning his phone calls. Bellamy waits outside of Ray's room, as Maggie injects him with amnio fluid. Ray wakes and tells Maggie that if he dies, he wants to stay dead. Ray asks Maggie to tell Elaine that if he comes back, not to trust him because it won't really be him. Tom and Rachel return home to find Janine waiting for them. Rachel explains that Maggie said to take it easy for the next little while before excusing herself. Janine tells Tom that Maggie guilted Rachel into doing this, pointing out that Rachel couldn't say no, after Maggie convinced her that everyone was going to die. Tom brings Janine into another room, so that Rachel will not overhear the conversation. Tom assures Janine that Rachel didn't jeopardize her pregnancy but Janine is not convinced and points out that the baby is growing abnormally fast. Tom tells Janine that they shouldn't focus on anything bad yet. Janine argues that the only reason that Maggie wanted Rachel to have the amnio is because Ray is sick and calls it an unnecessary risk. Tom is beginning to lose his patience and says that Maggie is trying to save a life but Janine argues that she is trying to do the same. Tom embraces Janine, saying that they have to put their faith in God and trust that it will all work out. Janine says that she is trying and Tom kisses her on the cheek. Tom then asks what Janine thinks about the name Nathaniel, saying that Rachel thought it up. Janine puts a false smile on her face and says that she likes it. Henry is in his workshop, clearly sad about the loss of investment, when Jacob arrives with a drawing for a sign for the factory. Jacob and Henry hug, as Henry looks at the sign for Langston & Sons. At the police station, Fred tells Bellamy that he got a lead on the group and that the leader is Joey Nolan. Fred explains that he went to school with Joey's dad and that he finds it hard to believe that Joey could be involved with this but adds that the people of the town are getting more and more afraid. Bellamy admits that Fred is walking a fine line and Fred says that it won't stop him from doing his job. Fred and Bellamy head to the bar and confront Joey. Fred questions where Joey was when the red crosses were painted all over town and Joey says that he doesn't know. Fred questions if Joey painted the cross on Mr. Miller's door. It seems that Mr. Miller called Joey's father years ago worried because Joey wasn't reaching puberty as fast as the other boys. Fred then reveals that Joey's father told him about the missing testicle and says that Joey painted the crosses at night because he doesn't have the sac to do it in the middle of the day. Fred then asks about Mr. Conrad's liquor store, pointing out that Joey is there five times a week. Joey counters by pointing out that Fred would be the one to know who is coming and going from the liquor store. Fred moves to physically confront Joey and Bellamy grabs Fred's arm. Joey points out that Fred called in the army when the Returned first came back because he knows that they are dangerous and not like the living. Bellamy asks what Joey means and Joey explains that the Returned are different and not natural. Bellamy asks Joey if he looks different and gets in Joey's face. Joey tells Bellamy to get out of his face. Bellamy says that you would think that someone with only one stone could respect other people's differences before slamming Joey's head into the table. Bellamy tells Joey to remember his face because if Joey has a problem with the Returned then he has a problem with him because he is also Returned. Fred is astonished at the revelation and Bellamy leaves without saying another word. Bellamy is back in his office, when Fred knocks on the door to say that he is going to put the officers out on patrol tonight to help keep an eye on things. Bellamy asks Fred if he believes that he went too far and Fred says that if Bellamy hadn't have done it, he would have done it. Fred asks if Maggie knows and Bellamy says yes. Fred simply says okay and closes the door. Rachel is sleeping when Janine wakes her up. Janine tells Rachel that Tom called because he is concerned about the anti Returned sentiment in town and suggested that the women go to Janine's sister's to be safe. Rachel questions if something else happened and Janine assures her that it just a precaution. Janine gives Rachel her shoes, saying that she has already packed a bag for Rachel. Rachel questions how long they are staying and Janine says that she is not sure. Henry shows up at Brian's house and Brian apologises, saying that he shouldn't have made it seem that he was so certain about the deal and that he is weighing other options. Henry cuts Brian off and says that if he backs out now, he will regret it because he is determined to get the factory going again. Henry argues that Langston furniture means everything to him and his family but this is also about revitalizing this town. Henry says that he plans to remind people what it means to make and own American made heirloom furniture, adding that this is about restoring the greatness of American business. William enters the room and introduces himself as Brian's grandfather. William explains that didn't want to make his existence known because of how people in the town feel about the Returned. Henry welcomes William back and William thanks him, adding that he is glad to know that Henry plans on getting the factory back on its feet. William admits to working in the factory before Henry was born and Henry then offers William a job, saying that they could use someone who knows what they are doing, if Brian is willing to make a deal. William tells Brian to walk Henry to the bank right now. Brian hesitates but William says that Henry knows exactly what he wants. At the bank, Brian is told that everything looks good on his end, Henry however is told that the bank has stricter requirements for business loans than he remembers. The banker tells Henry that the land isn't worth what he thinks it is and will need more collateral. Henry asks about re-mortgaging his home and Brian questions if Henry is sure. Henry says that if this is what it takes to get the deal done, then this is the way it has to be. The banker agrees and tells Henry that they can make the loan happen now. Elaine is with Ray, talking about making him sloppy joes when he gets home, as Maggie watches from the observation window. When Fred approaches Maggie, she asks him to take Elaine home as it will be awhile before the injection works on Ray. Maggie says that Elaine needs to shower and sleep. Fred asks if Maggie is getting any sleep and she reveals that the only way she could convince Elaine to go, was to promise to stay with Ray for the night. Maggie then brings up Lucille's visit and her apology and admits that she was hard on Lucille. Fred says that Lucille was probably harder on herself. Lucille is folding laundry when she get a call from Maggie. Maggie admits that things have been better and admits that she was angry with Barbara as well and that she didn't welcome her back with open arms. Maggie says that she understand why Lucille said what she said and Lucille starts to talk about taking it back; however, Maggie points out that Lucille cannot do that. Maggie asks for them to move forward. Bellamy is driving when he gets a call from Fred, who says that something might be going down tonight. Apparently, someone saw what Bellamy did at the bar and decided that The True Living were taking things too far. Bellamy decides to head over to Tom's church and Fred leaves to do a few laps around town to make his presence felt. Tom returns home to an empty house and he picks up the bear Rachel bought for the baby. In a drawer, Tom finds Janine's pregnancy journal and in it, Janine asks how she can let Rachel risk her baby. Tom throws the book on the bed, tucks the teddy bear in his pocket and calls Janine. Janine says that she is with Rachel at an OBGYN in a different city. Tom questions if something is wrong and Janine says that she thought Janine should have a follow up with another obstetrician. Tom asks to speak with Rachel and Janine says that Rachel is in the middle of her appointment. Tom tells Janine about finding her journal and Janine tells Tom that the diary wasn't for him to read and that it's private. Tom tells Janine that they need to talk and that as soon as Rachel is done with the doctor, he wants her to bring Rachel home. Janine does not answer, so Tom decides to answer his call waiting. It turns out that it's Bellamy, who reports that the people who painted the crosses are up to something. Bellamy adds that he is on his way to the church just in case and Tom promises to meet him there. When Tom tries to return to Janine, he finds that she has disconnected the call. Bellamy is handing out water at the church when Tom arrives. Bellamy reports that things are fine and that he has not told the Returned about the threat. Tom says that he cannot stay because Janine took Rachel to an obstetrician and is getting a little over protective about the baby. Tom gets a call and excuses himself. The call is from Rachel who says that Janine is acting strange - like she is trying to keep her there. Rachel says that she wants to be home in her bed. Tom asks where Rachel is and Rachel replies that she is at Kimberly's like he wanted. Tom questions if this is what Janine told Rachel and she confirms and adds that she was told Tom was worried about the reaction to the Returned. Tom says that Janine is lying and is trying to keep Rachel away from him. Janine questions why Janine would do that and Tom says that Janine knows that he is in love with Rachel and that Janine knows that without Tom, she cannot have the baby. Rachel is shocked but Tom says that he has been trying to do the right thing all of this time but the truth is he only loves Rachel and always has. Rachel tells Tom that she loves him as well. Tom tells Rachel to hang tight and that he is coming to get her. Tom heads to see Bellamy to say that he has to go. Bellamy promises to stick around and keep an eye on things. Before Tom can leave, someone throws tear gas through the church window. Bellamy instructs everyone to get down and cover their faces. Tom tells the Returned to follow Bellamy out the back door. The Returned rush for the door and Tom struggles to get the door open. Tom stands coughing in the middle of the street and Joey runs into him. This is episode eight of season two and we are still no closer to finding out who The Returned are or why they have Returned. A lot of time has been focused on the illness that is killing off the Returned. This week we may have a potential cure and hopefully that will bring an end to this storyline so that the writers can go back to focusing on the meta plot. I'm not sure I like the implication of the "othered" Returned. Have Bellamy stand in front of Joey and ask if he looks different ignores the fact that there is a racial difference between these two men. Bellamy isn't only different because he is Returned but because he is a man of colour. 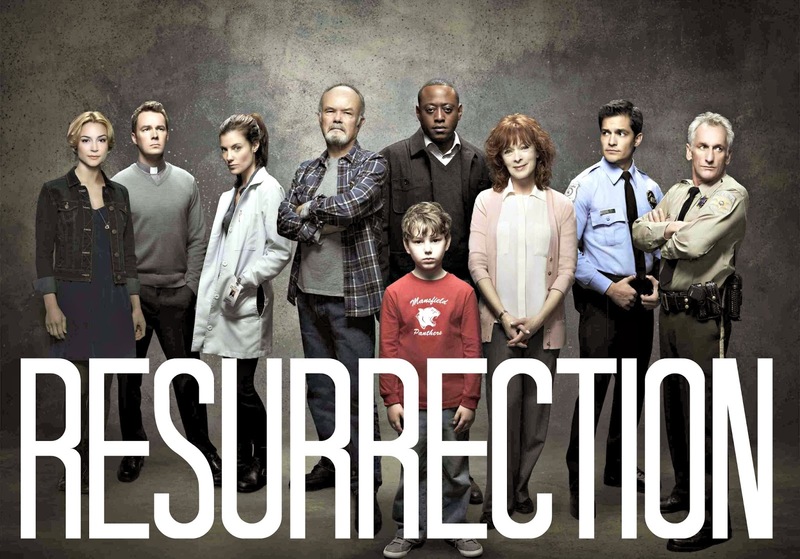 Resurrection has studiously avoided any mention of race and furthermore, Bellamy is the only character of colour of note in the series. In this scene, I could help but think of the elephant in the room that the writers of Resurrection ignored to focus on the imagined difference of The Returned. I knew Janine returning and getting back together with Tom was not a good idea. They have turned her character into a baby obsessed woman thus conversely making Rachel the magical walking womb. Was it really necessary to have Janine be resentful of Rachel's pregnancy and to have her be obsessed about the baby? It's typical and doesn't at all challenge the narrative that all women want to mother, or in the case of Janine are desperate to mother. It would have been far more interesting if the conflict was about Janine wanting to stay child free and Tom wanting to raise his child. So we all know that Tom is going to Return right? There is no way that they are going to let go of this insipid little love triangle, even though Resurrection certainly doesn't need it. Margaret is once again keeping secrets and trying to manipulate her family. It makes no sense given that Margaret was just a little girl when William was killed that she refuses to tell Henry what is going on. Sure the truth about his family might hurt, but it is all in the past and there is nothing he can do to change it. I feel that this deception is just a cheap route to turn Margaret into an antagonist.